Long-press the Home screen and choose Apps and Widgets. You’re taken to the Applications screen, which you could have also arrived at by touching the Apps icon on the Home screen. Scroll the list of widgets to choose the one you want to add. For example, choose the Calendar widget to see an overview of your schedule on the Home screen. 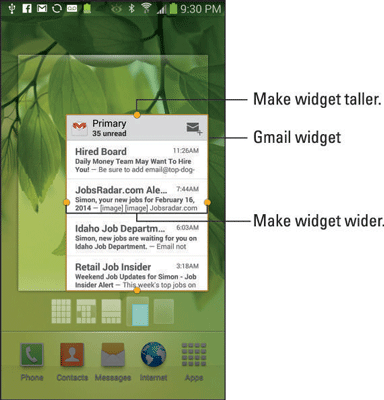 Drag the widget to the Home screen. At this point, the operation works just like adding an app. One major difference, however, is that some widgets can be very big. Room must be available on the Home screen panel or you won’t be able to add the widget. Some widgets may require additional setup after you add them, such as setting a few quick options. You might also see a resize rectangle around the widget. Drag the edges or corners of that rectangle to resize the widget. The variety of available widgets depends on the apps you have installed. Some applications come with widgets, some don’t.